A DRUM is a open, hollow cylinder (the body) with a membrane (head) stretched over one or both of the openings. This is one of the most familiar and ancient of all instruments and is used in almost every human culture. Drums are usually played by striking the head with a stick or hand. The SNARE DRUM, sometimes referred to as the side drum, is descended from military marching drums. 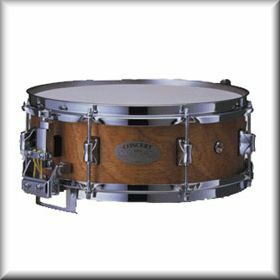 The typical snare drum is relatively small, with a shallow body and two heads. The drum is played in a horizontal position, supported by a stand in a concert formation or hanging at the player’s side in a marching formation (this is the genesis of the term “side drum”). Only the upper head is struck when the drum is played. Wires, called snares, are stretched across the lower head, producing a distinctive rattling sound when the drum is struck. Usually, a lever on the side of the drum is provided to loosen the snares, eliminating the rattle. The snare drum is most often played with wooden drum sticks. Brushes are also commonly used for a softer effect. Common special effects played by the snare drum include playing with the snares off and the rim shot, where the rim of the cylinder is struck rather than the head. The snare drum has indefinite pitch. The orchestral BASS DRUM is a large drum with two heads. It is generally played in an upright position, although many ensembles have drums mounted on special frames that allow the instrument to be rotated to a horizontal position. The bass drum is usually played with a wooden stick whose playing end is covered in felt, wool, or other soft material. One stick (sometimes double-ended) is generally used. Sometimes, the player will place a hand on the drum head to dampen the sound. Either head may be played. 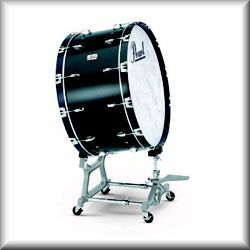 The bass drum has indefinite pitch. Bass drums are sometimes played with two sticks or with timpani mallets for special effects. Bass drums used for marching are usually smaller in size. They are carried in front of the player, resting on the chest and belly, with shoulder straps for support. A marching drummer usually uses two sticks with somewhat hard felt coverings, one for each drum head. The primary purpose of the bass drum in a marching band is to provide the beat and keep the players in step. In drum kits (also called trap sets), the bass drum is even smaller than the marching bass drum and sometimes only has one head. The head(s) are usually damped by a pillow or blanket placed inside the body, making the sound very short and sharp. The drum is played by means of a hard felt mallet attached to a foot pedal. TIMPANI are large drums with a bowl-shaped body (only one opening) and a single head. 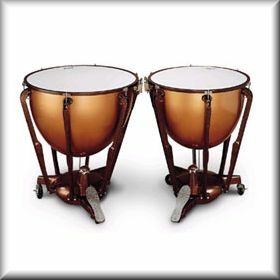 Most modern timpani are made of fiberglass, formerly, most were made with copper or bronze bodies. The timpani is unique among the drum family because it can be tuned (it is a variable-pitch percussion instrument). The range of each particular drum is small - generally less than one octave. Timpani are generally used in sets of two or more. Timpani are played with a variety of mallets, varying in hardness and composition. They are among the most powerful of the percussion instruments, and can dominate the sound of a band when necessary. There are few special effects possible with a kettledrum, the most notable being the glissando, which is possible only on drums with a pedal. A CYMBAL is a metal disc, almost flat but with a slight bell shape, that is struck with a stick or mallet, or, when used in pairs, struck together. Modern cymbals are Turkish in origin, although the cymbal is one of the oldest musical instruments known. A SUSPENDED CYMBAL is a single plate, hung from a string or placed on a stand so that it is free to vibrate. The cymbal is usually played by striking it on the top surface with a mallet or drum stick. The cymbal can also be struck with brushes, or scraped with a triangle beater or a coin. This type of cymbal is a standard part of a drum kit (trap set). Suspended cymbals are of indefinite pitch, but larger (in diameter) cymbals have a deeper tone. Several variations of the standard suspended cymbal have been created. For example, a sizzle cymbal is a standard flat cymbal, with a number of holes drilled near the edge. Rivets slightly smaller in diameter than the holes are installed, giving a "sizzle" effect when the instrument is struck. Nothing in concert music is quite like the sound of CRASH CYMBALS. They are always used in pairs, and are played by striking one with the other. A crash cymbal is similar in design to a suspended cymbal, but is usually larger. Hand loops, usually of leather or strong cloth, are attached through a central hole. The cymbals are crashed together with a somewhat glancing blow. Often, the player will hold the cymbals high after the crash to allow the sound to resonate. 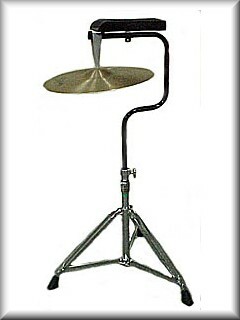 The HI-HAT is commonly seen in drum kits (trap sets). It consists of a small suspended cymbal, under which is mounted a similar cymbal, upside down. The upper plate is attached to a mechanism, usually activated by a foot pedal, that allows it to be moved quickly up and down. Only the top cymbal is struck, usually with a drum stick or brush. Other effects are achieved by letting the top plate fall onto the bottom plate, or moving it after it is struck while the sound is still ringing. 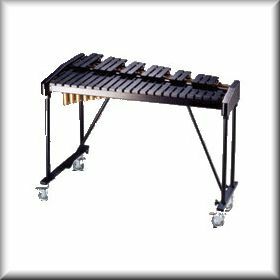 Mallet instruments are fixed-pitch instruments that are played with one or more mallets. The xylophone is the typical mallet instrument. Mallet playing can be very complex, and mallet percussionists are recognized as possessing a specific skill. The XYLOPHONE is the prototypical mallet instrument. The instrument consists of a series of wooden bars, each tuned to a specific pitch. The bars are contained within a horizontal frame that allows them to vibrate freely (usually suspended from elastic strings). Metal tubes that resonate the sound are placed under the bars. The bars are usually arranged in a manner similar to that of the piano keyboard. Lower bars are longer and sometimes thicker than the higher bars, and the resonating tubes for the lower notes are longer. The range of the instrument depends on the number of bars used. The xylophone is played with at least two mallets (one in each hand). More advanced players can play with multiple mallets in each hand, allowing the playing of fairly complex harmony. The sound of the xylophone is relatively dry and staccato. Sustained notes are played by rolling (as on a snare drum). Tone quality is rather inflexible on a xylophone, althogh subtle differences can be made by varying the hardness of the mallets used. A set of BELLS consists of a number of metal bars, each tuned to a specific pitch. The bars are suspended in a horizontal frame which allows them to vibrate freely. They are arranged in a pattern similar to that of the piano keyboard. The bells are played with very hard (usually brass) mallets and have a sustained ringing sound. Usually, two mallets are used. The range of the instrument depends on the number of bars in the set. CHIMES, also known as tubular bells, are long metal cylinders mounted vertically in a frame that allows them to vibrate freely. Each tube is tuned to a specific pitch. The percussionist strikes the top of the tube with a hammer-like wooden mallet. The sound is similar to that of a small church bell. Most sets of chimes are equipped with a damper mechanism, usually activated by a foot pedal, to control the length of the notes. An instrument with indefinite pitch, the TRIANGLE is used to put high overtone highlights on the band sound. As with most indefinite pitch instruments, larger triangles produce a deeper tone. The triangle is a metal bar, bent into a triangle with one open corner, suspended from a string or wire. It is played by striking it with a beater, usually a small metal rod. The tone is clear and high-pitched. The trill is a special technique where the beater is rapidly vibrated in one of the corners, making a sound similar to an old-fashioned telephone or alarm clock bell. One of the oldest of the percussion instruments, the TAMBOURINE is a small drum body, with or without a single head. Jingles, or pairs of small cymbals, are placed on spindles in slots on the body. The tambourine can be shaken or struck.